The period of Victorian furniture design produced activity equal to the vast industrial output of the greater part of the 19th Century. The styles were quite diverse, but amongst the most important Victorian furniture designers were William Morris, William Burges and Arthur Crace. Much of their work drew inspiration from the Medieval and Tudor periods and an outstanding example of this period can be found in a fine cabinet at Knightshayes Court, Tiverton, Devon. A Victorian mahogany breakfront library bookcase (FS18/852), which sold for £3,000 in the furniture auction of our April 2013 Fine Sale. Notable Victorian furniture makers included Holland & Sons, who operated from 1803 to 1942 and were one of the principal rivals to furniture makers Gillows. The firm of Holland & Sons became cabinet makers and upholsterers to Queen Victoria and their first commission for her was at Osborne House on the Isle of Wight in 1845. The Gillows factory was a dominating force in the 18th and 19th Centuries, but by the end of the 19th Century had run into financial difficulty and began a loose financial arrangement with Waring of Liverpool, which became Waring and Gillow in 1903. Later in the 19th Century, the work of EW Godwin was amongst a range of new styles taking decorative influences from the East. The Aesthetic Movement also saw the rise of Liberty furniture and designers including Archibald Knox and Arthur Silver. 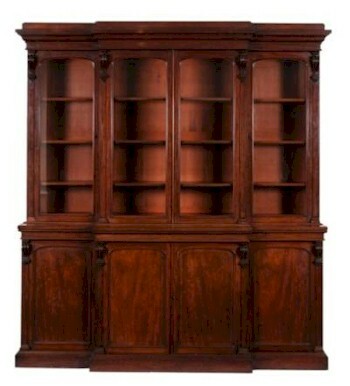 A fine example of Victorian furniture: a Shapland & Petter wardrobe, which formed part of a suite. 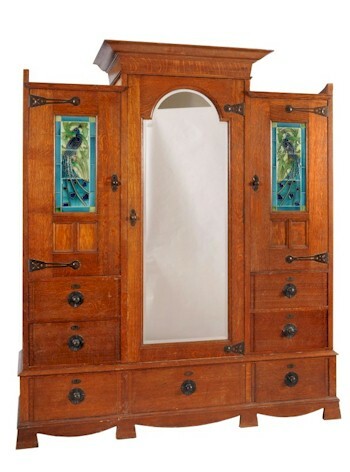 The Arts and Crafts Movement and Art Nouveau styles also have their beginnings in the late Victorian era and furniture makers such as Shapland & Petter of Barnstaple, Liberty & Co in London and Wylie and Lochhead in Glasgow originate from the period. Bearnes Hampton & Littlewood hold regular auctions that include many examples of Victorian furniture.